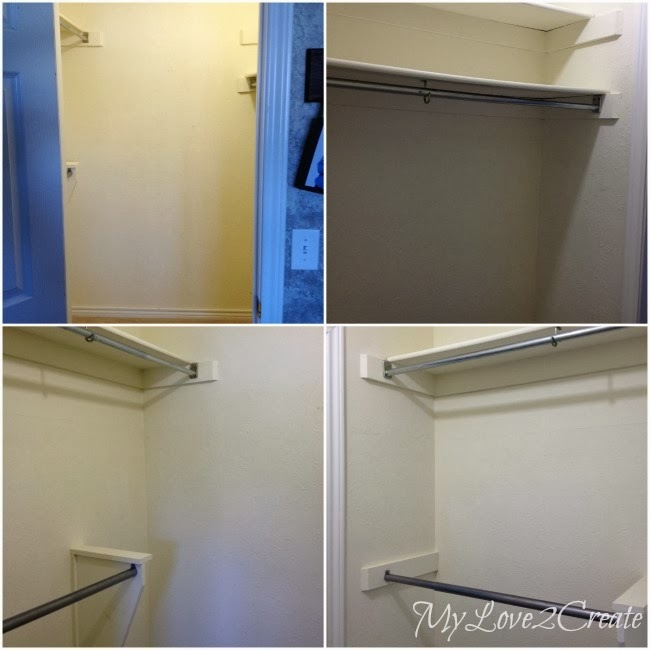 It is time for an update on my master closet makeover! If you missed the first post check it out Here. I have to admit I dreamed that this would be the reveal....ha ha ha! I am getting a huge reality check and realizing that big projects are just that...BIG! Not to mention the fact that I have six kids and a husband to feed, a house to keep up, weekends filled with sporting events, and what? You want clean underwear and socks? Ok...mountains of laundry...even I am sick of digging through! First thing I learned...don't try to take out the bottom shelf first...It won't work with out the top gone. 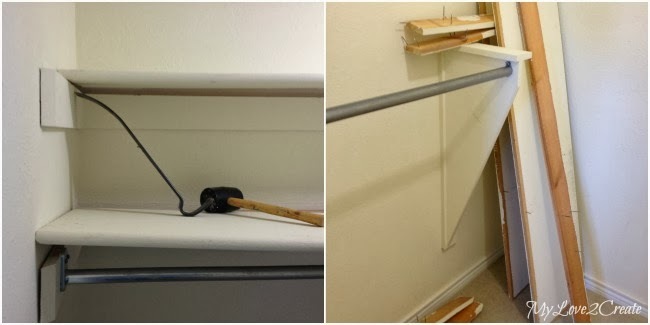 I used a crow bar and mallet to slowly remove the shelves and the 1x4's on the wall. On the top right you can see I finished one side and was ready to start on the other. Oh, and the second thing I learned? Don't push into the wall with the crowbar. Yep! Actually I just wanted to learn how to repair drywall, I mean why not, right? I think I did a pretty good job for my first time. Thanks to this video Here! And I used my new mulit tool too, yippee! Once I got all the old shelves out of the closet I moved my pre-painted boards in for a dry fit. I put down the base I had made in the first post, and simply set the boards on top, they stayed really well. 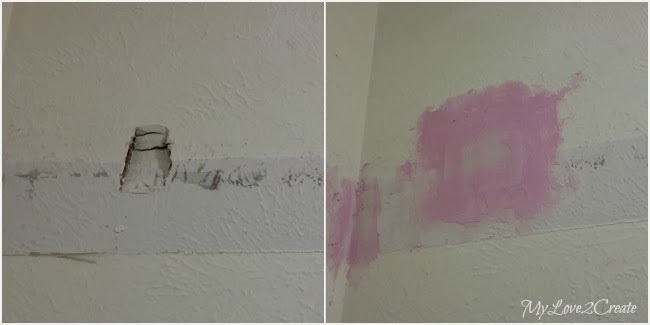 The far left photo is a picture of tower one, it is what you see straight into the closet, on the back wall. I will have double hanging on both sides of that tower. Tower two will be on the right when you walk into the closet, you can see in the middle and right photos different angles of how things will fit together. 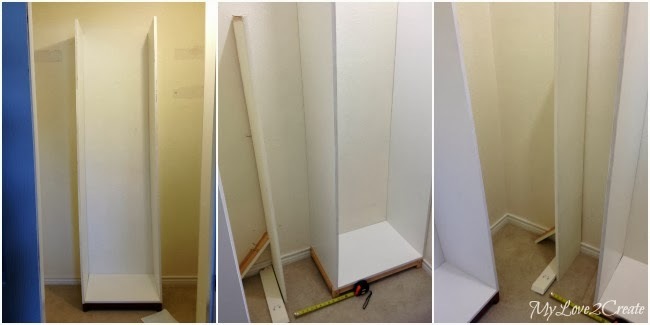 I am still debating about the shoe shelf, I grabbed an old closet board to see how tight it will be to get my hanging clothes...we will see, but I think it will work. My husband and I don't have a ton of clothes (since we got rid of half of them!) and so we will be just about right on the hanging clothes and with the drawers and shelves it will be perfect! Since I decided to put tower two up against the wall I need to remove the base board. I used my multi tool again to cut it off and carefully pried the rest off the wall, I will need part of it later to put back on the section that wasn't covered by the tower. Then I set the base down and dry fitted it again. In case you are wondering, the base is short so the back of the tower will actually rest on the moulding. 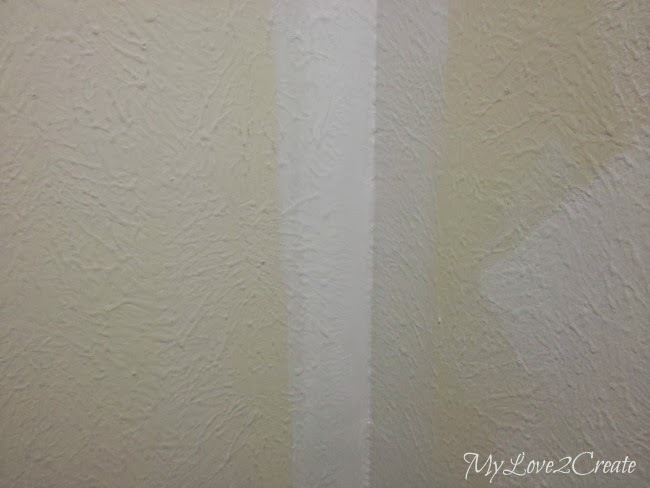 It is nice I don't have to remove all of the moulding! On to my favorite part, building!! I created a jig to help me get this baby put together on my own. 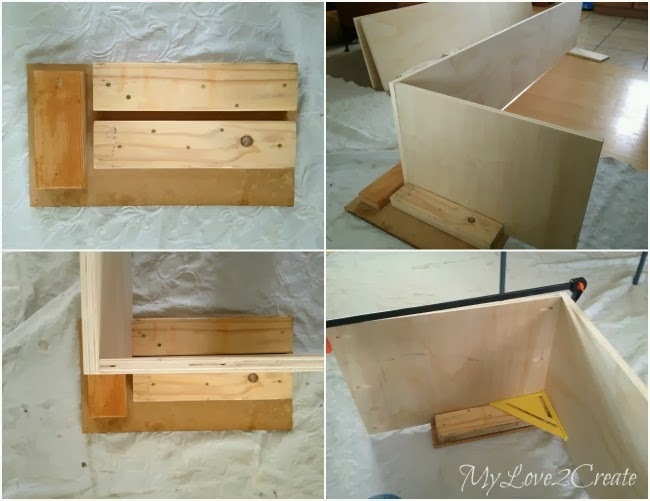 It holds my boards for me and I can keep it square while I drill in my pocket holes! Awesome right! I will get some good use out of this baby, I got the idea Here. As you can see I made this before I primed and painted my boards, in the photos above I was testing it out. Later that same day I realized I had some money that I had earned that I had forgotten about and I went ahead and ordered some Kreg right angle clamps. When I finally got to building I didn't need the jig because the right angle clamps had arrived in the mail. I used it for the first boards and it was awesome!! If I hadn't ordered the clamps it would have saved my life, so it is totally worth making your own if you don't have the clamps! I secured the boards with the middle screw and then removed it to add the bottom screw. I got both long boards attached and then screwed on the bottom board. 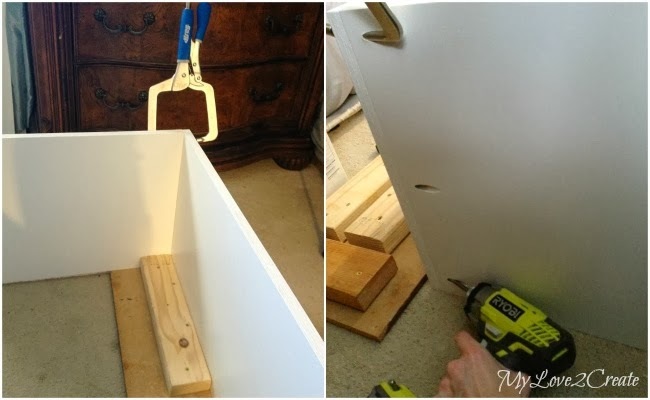 I used my now favorite right angle clamps (seriously I don't know how I have been doing pocket holes without them!) on the top and clamped the bottom boards with one of my long clamps, and screwed them together! Next, I needed to attach my shelves. 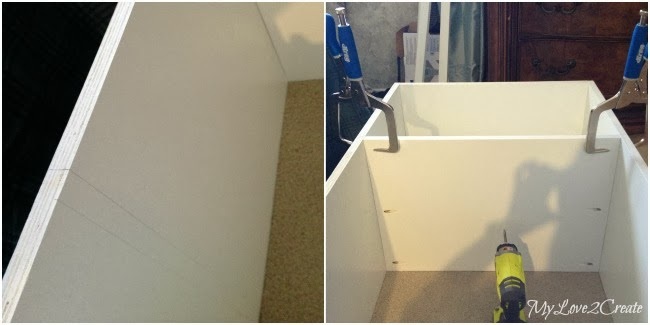 I opted to do fixed shelves instead of holes with shelf pins. I measured and drew lines on the board where the shelf needed to go (do this on both sides) then I clamped and screwed them together. I should mention that the whole time I am checking for square and level, a very important thing to do! This is an awesome shot of my walls in the closet. I had to paint them white to match the towers, and I am hoping I can make my oops paint last so I don't have to by another gallon...fingers crossed! Last I attached the bases to my towers. 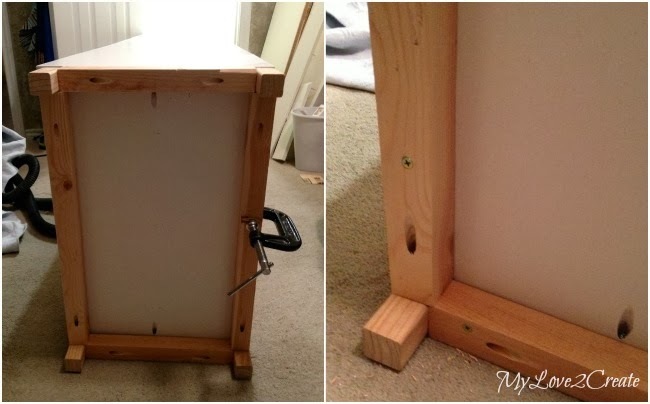 I clamped them on and used 2 inch wood screws drilled into the bottom. I am almost done with all the drawers, and face framing. I hope to get that post up early next week! Thanks for tuning in, to my master closet makeover! 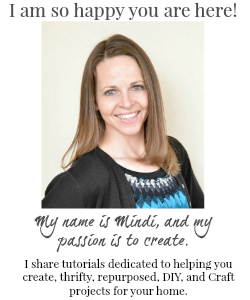 you amaze me Mindi! So cool! That was great progress! It makes me remember the time I built my bookshelves and thinking: Wow, I just built these beasts! :D I love those clamps. Progress looks good, Mindy! I don't know how you do it. 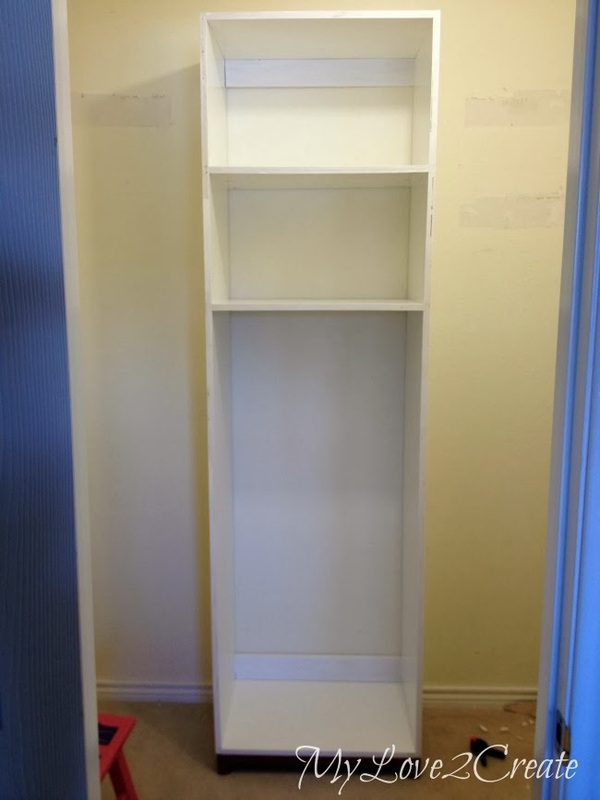 What a difference practical storage makes! You've got your hands full--I hope this makes life a little easier for you! 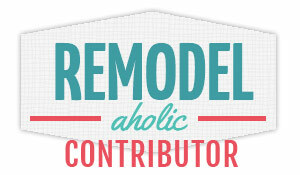 Thanks so much for sharing this at Frugal Crafty Home Blog Hop. 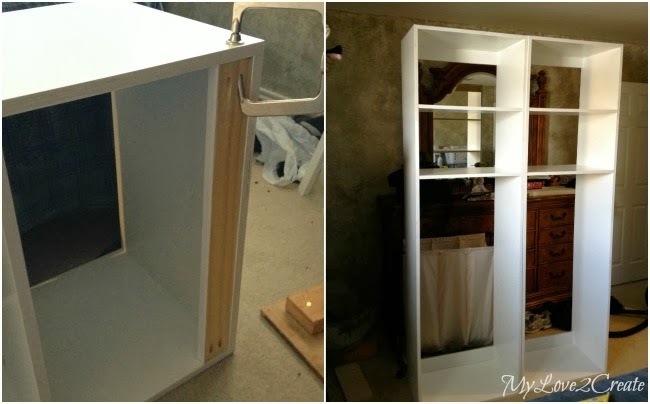 I so enjoyed your update on the Master closet , great tutorial. Looking forward to the finished project. Thank you for sharing with the Clever Chicks Blog Hop! I hope you’ll join us again next week! Wow..you are talented! My closet needs some organization, I'd love for you to come do mine! lol Thanks so much for linking this up at Sewlicious Home Decor. This weeks party in LIVE, I'd love for you to stop by and link up this week! Thanks so much for linking up to the TWIRL AND TAKE A BOW link Party! I am co hosting Fluster's Creative Muster Link Party!! Thanks so much for linking up!